DISCLAIMER: Due to the nature of this game’s plot, this review contains spoilers for Hakuoki: Kyoto Winds. 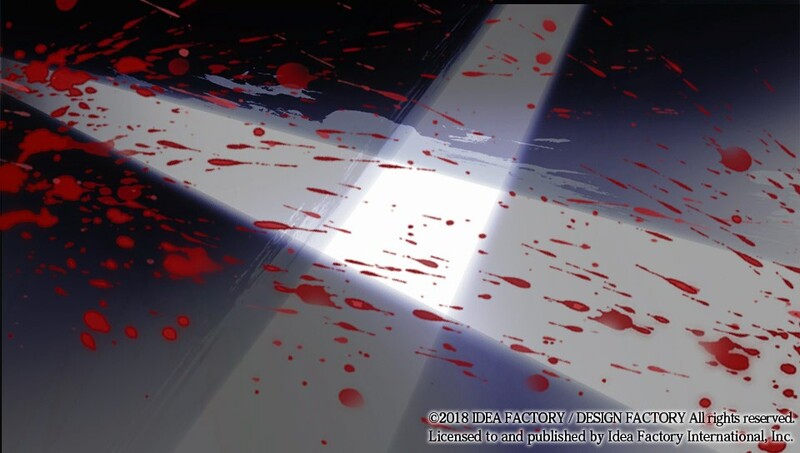 Last year, Idea Factory International set out to become the new gold standard for otome games. Between holding the Official Hakuoki: Kyoto Winds Festival + Cafe and releasing Hakuoki: Kyoto Winds on both PS Vita and Steam, it was an impressive effort. IFI wanted people to know that they were Hakuoki’s new home and that the otome community would find a passionate ally in them. 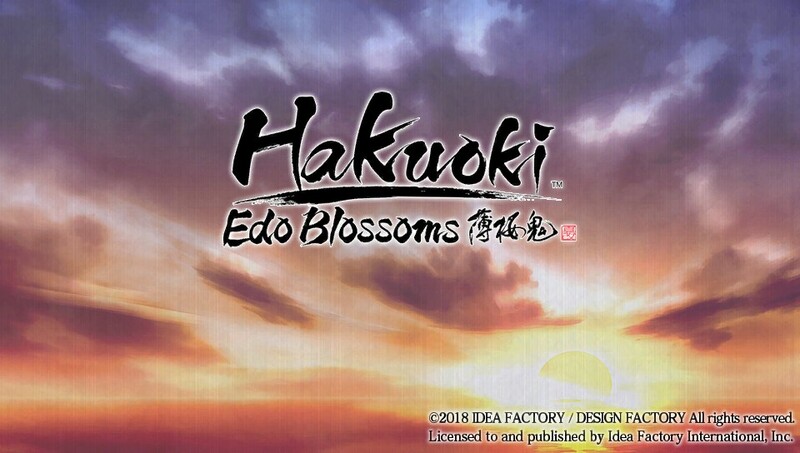 Those efforts continued this year with the Official Hakuoki: Edo Blossoms Festival to commemorate Hakuoki: Edo Blossom’s release. However, goodwill and passion alone does not make a good game or localization. 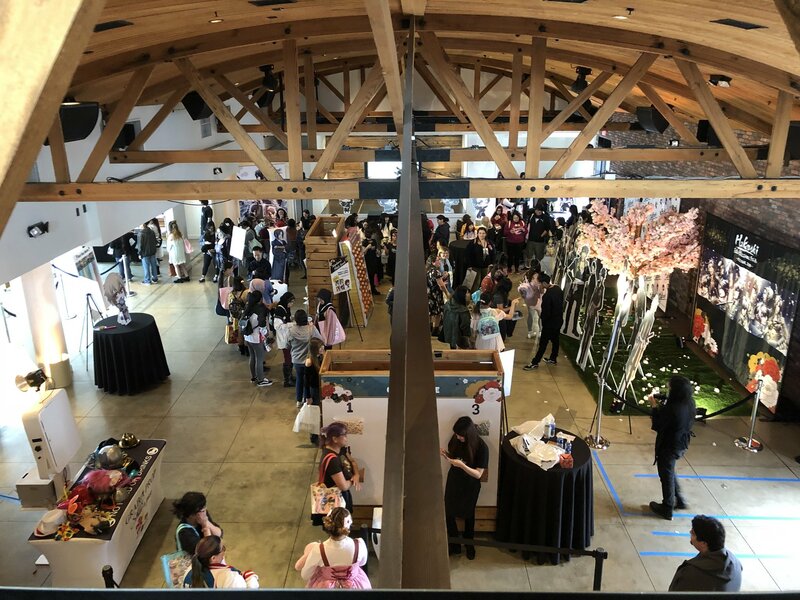 The Official Hakuoki: Edo Blossoms Festival which IFI held in celebration of the game’s release. 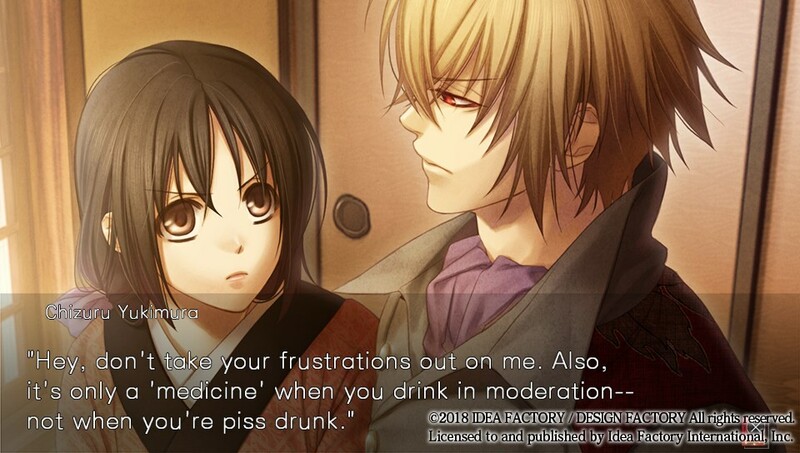 When I reviewed Kyoto Winds last year, I had some concerns. One was the developer’s decision to split the original Hakuōki ~Shinsengumi Kitan~ in two and release each half as an enhanced remake. The other was with the quality of IFI’s localization. However, I was hopeful. Being a casual otome fan and Kyoto Winds being my first exposure to the franchise I was intrigued. I wanted to see how this tale would end and how Chizuru would grow. So, will Chizuru and men of the Shinsengumi live up to my hopes and stand victorious? Or will all their efforts turn to ash and blow away into the wind? Let’s find out. 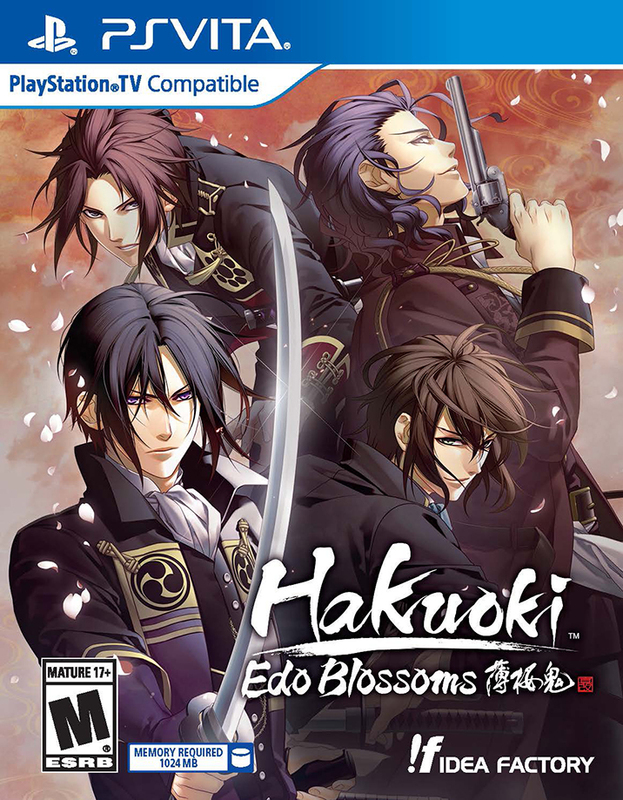 Time to delve into the world of Hakuoki again with Edo Blossoms… Providing you’ve played the first game that is. Before we begin, we need to address the odd way in which Kyoto Winds and Edo Blossoms relate to each other. Instead of being a sequel, this is the second half of Hakuōki ~Shinsengumi Kitan~. 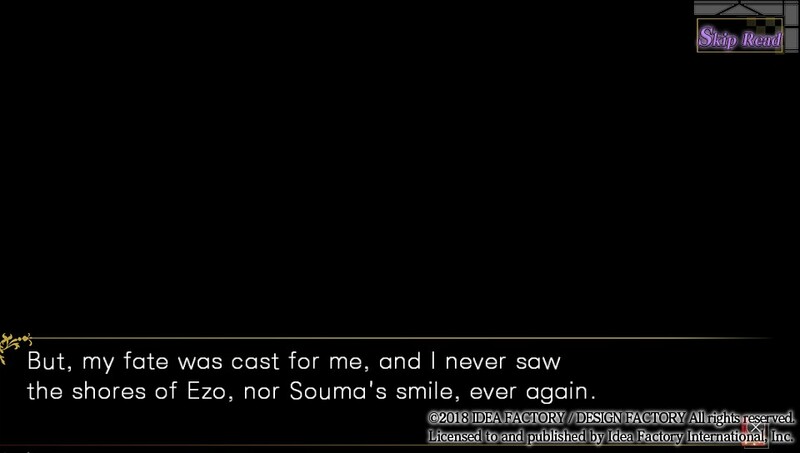 In short, this means this is a direct continuation from Kyoto Winds and you should have played that game before even considering this one. Thus, there will be spoilers for that game from this point on. In addition, I’m going to assume you’ve played Kyoto Winds. The reason for this is to prevent redundancy. The core problem with Edo Blossoms is that it’s literally the second half of a game. Many of my thoughts on the technical details of Edo Blossoms (graphics, sound, interface, etc.) are the same as Kyoto Winds. If there are differences between the two game engines, I couldn’t find them. So, Instead, I’ll be focusing on how these elements are used to tell Chizuru’s story. Like I mentioned, there’s not a lot, if any, differences between Kyoto Winds and Edo Blossoms when it comes to technical details. While the characters do get new outfits, that’s about it. Graphically and musically it’s the same game. That said, the way Otomate uses those elements to tell the story holds up. The Westernization of Japan is actually a recurring theme in Edo Blossoms. 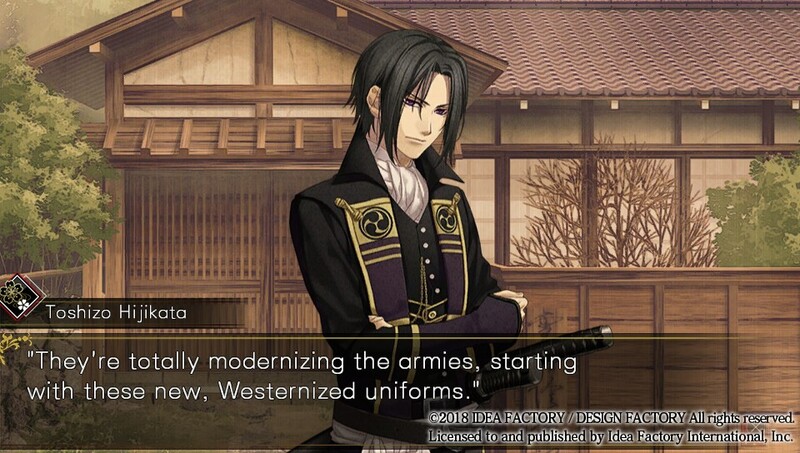 So it’s quite interesting to see the Shinsengumi don Western-styled attire as they fight for their ideals. Many visual novels are perfectly fine with describing the action and maybe providing a few sound effects. However, both Kyoto Winds and Edo Blossoms do try and go one step further. Both games make effective use of their visual and audio elements. For example, if you hear and see four sword slashes, but only three bloody thwacks, there’s a narrative reason for that. This kind of attention to detail is apparent in other Otomate games such as Norn9: Var Commons. The same can be said of the music. There’s actually quite a bit of combat in Edo Blossoms. While the visual and audio elements the game uses to showcase that combat is simple, it is effective. The music in Kyoto Winds and Edo Blossoms is quite enjoyable. Both games use its music appropriately to communicate the mood and feeling of each scene. Which is good. Since the voice acting is still in Japanese, it helps to communicate the emotional tone of the scene. As for the voice acting, it’s fitting. Many of the actors are well known and turn in great performances. Sadly, there is no dub, though that’s standard when it comes to otome titles. While both Kyoto Winds and Edo Blossoms are one and the same in technical details, it’s in the game’s progression where they couldn’t be more different. In most romantic visual novels, there is a common route which then branches off into character-specific paths. In my Kyoto Winds review, I used the example of a river to illustrate this. This was because I had assumed that Kyoto Winds had to feed into whatever common route Edo Blossoms would have. Except it turns out that Edo Blossoms doesn’t have a common route. Instead, it contains all the individual character routes you’d find in the latter half of a romance visual novel. 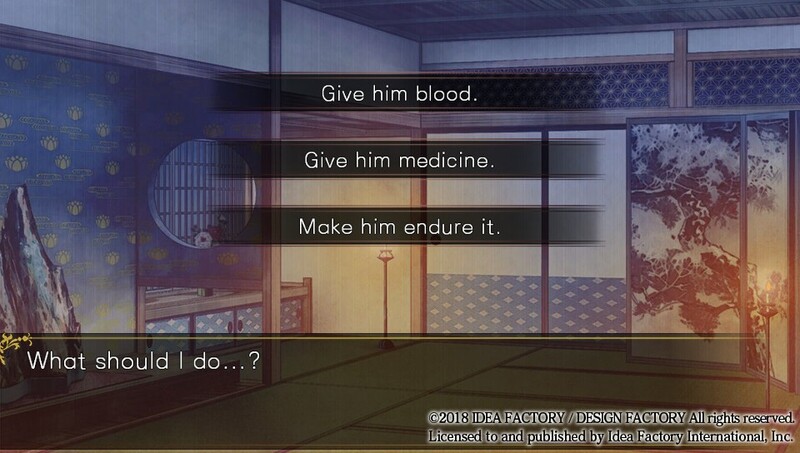 The route selection screens from Edo Blossoms. While this method of selecting a route could work, here it really serves to drive home the point that this is the second half of a story. When you start the game, you’re taken to the above screen to pick which route you want. The story will then quickly recap the events of Kyoto Winds before picking up in Edo. In short, this means you’re playing the latter half of a story. This is a bit of a problem. I’ll touch more on that later, but for now let’s focus on the routes themselves, namely their length and endings. Each route consists of a prologue, an epilogue and four chapters. 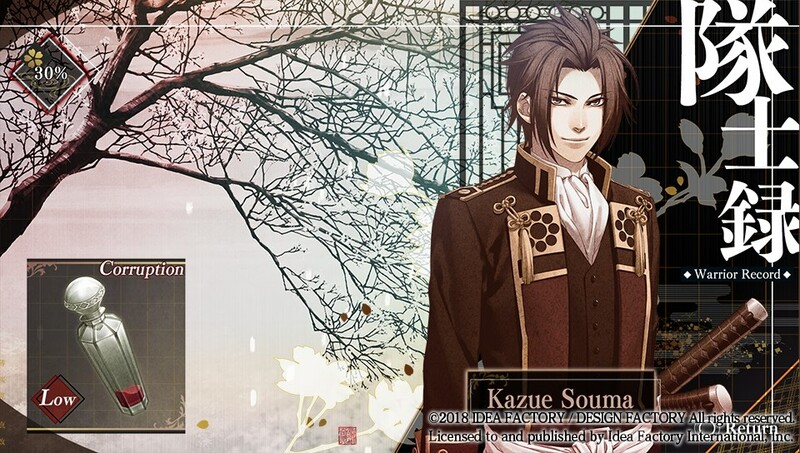 The sole exception being Toshizou Hijikata who gets five chapters and Chizuru’s solo route which has one. Within each chapter are two kinds of choices. The first are your basic decisions that raise your affection with your love interest. The other relates to the corruption system. The vial in the lower lefthand corner of the screen indicates the level of corruption a character has. Based on how you handle their bouts of bloodlust, it’ll lower, maintain, or go critical. The corruption system is something that’s new to this game. Functionally, it’s just a way to lead to a bad ending. During each chapter your bachelor will suffer a fit of bloodlust. You’ll be given three options. The first is to let them feed on you and erase their corruption. The second is to give them some medicine which will maintain the corruption level they are at. Finally, the third to let them endure it and max out their corruption. However, this is the real choice that matters in each chapter. During every bout of bloodlust, you’ll be given these three choices. While the system is simple and self-explanatory, it’s also predictable. Near the end of the chapter, the game will check the corruption of your bachelor. If it’s critical, then you’ll end up getting a bad ending for that chapter. If it’s below that you’ll continue to the next one. This means each chapter has a possible bad ending. That is until you hit chapter four. At the end of chapter four, the game will also check your affection level. If you haven’t maxed out their affection, and they are uncorrupted, you’ll get the “unrequited love” ending for that character. Only if you max out the affection meter can you get that character’s true ending. This means that each character technically has six endings. Which means there are over 70, with many bad endings having very terrible things happening to poor Chizuru. I should note there are two exceptions. And this is one of the tame bad endings. There are a few that honestly would have fit perfectly well in something like Corpse Party. These two are Sanosuke Harada and Chikage Kazama who do not have a fury form, thus no corruption. In these cases, affection seems to be the sole determiner in clearing a chapter. Personally, I found this to be a positive since it made things less predictable. However, that’s also because these two along with a few other characters get additional development. The one thing I did notice that really bothered me was the difference in quality between certain routes. Some routes have additional dialogue and scenes that occur if you’re raising your affection with those characters. It makes it feel like an actual relationship is being built as opposed to just running through the motions. Which, is sadly how the other routes feel in comparison. That being said, let’s talk about the writing itself on the next page.